« Personal Money-Endowment Policy Is An Investment? 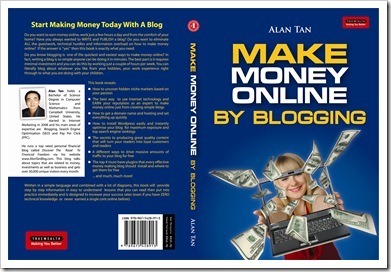 You are invited to my “Make Money Online By Blogging” Book Talk on 22nd September 2012(Saturday) at the MPH MPH One Utama, Petaling Jaya. Instead of watching videos on YouTube, or just making friends on Facebook, or reading entertainment and political blog, wouldn’t it be better to spend that time GENERATING Blogging INCOME online for Yourself, Your Family and Your loves ones? So feel free to join my talk to find out more. This will be my third book talk at MPH. If you want to know more about me and my Blogging/CPA book, this is your golden opportunity to meet me personally eye to eye. You may ask me questions, talk to me, get my autographs and even take your photos with me! So turn up with your colleagues, family and friends, and have fun. And yes, you might even learn a few new ideas and things! Remember to tell your family, friends and acquaintances about this book talk! P/S: I can proudly say that this would the first book about WordPress blogging(English) ever published in Malaysia! Book Talk on “Make Money Online Without Selling Anything!” by Alan Tan at MPH Megastore One Utama – 12 March 2011. This entry was posted on Tuesday, September 4th, 2012 at 11:45 am	and is filed under Make Money. You can follow any responses to this entry through the RSS 2.0 feed. Both comments and pings are currently closed.